Testing battery refers to the complex of the tests that are performed in short period of time, typically within 1 or 2 days. The advantage of the testing battery in relation to single test is that it gives a more complex feedback of the state of the athlete and allows to evaluate multiple abilities. In cotrast, testing battery is usually more demanding for athlete compared to single test. Testing battery may be compiled from variety of tests not only performance tests. 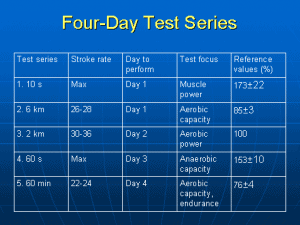 Day 1 – 1) 5 maximal strokes on rowing ergometer to determinemaximal power. Jensen (2005) added additional 60 minute test to the aforementioned battery and developed also training suggestions based on those tests (Figure 1). The golden standard or the reference of those test is the 2000 meter test, that is approximate to specific rowing performance. 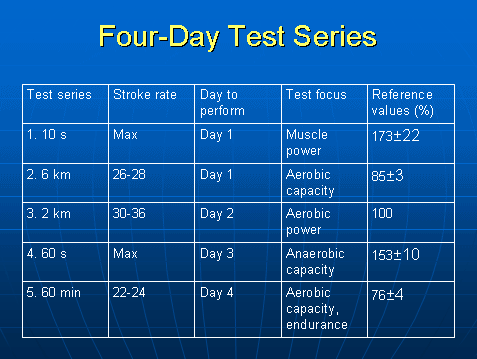 The suggested ranges of the other performance tests are shown in the last columns and if not falling with in the suggested values, this is the ability that the athlete needs to focus . For example, if the 60 minute test is approximately 70% of the 2000 meter test result, the athlete lacks basic aerobic capacity. This kind of testing battery has a huge advantage compared to any single test, but is demanding on the athletes and can not be done very often, since its difficulty to fit into the genreal training plan. Performance tests can be accompanied also with the body composition tests or physiological tests depending on the discipline and time of testing. For example, it is vital to test body composition frequently in sports that require mainpulations with body weight (wrestling, judo, weight lifting, etc). In those disciplines body composition tests are very important, while testing body composition in runners for example is of secondary importance.